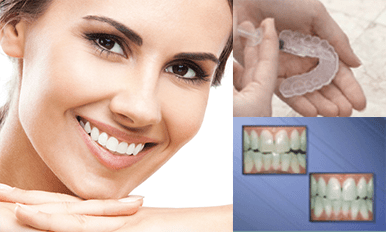 Whitening is the least expensive and simplest way to brighten the color of your teeth. Bleaching is used to whiten dark, dull or stained teeth. Darkening of the teeth can be caused by the natural aging process. Stained teeth can be caused by foods and beverages such as coffee, colas, tea, red wine and berries. Tobacco products like cigarettes, cigars and chewing tobacco, can cause teeth to take on a yellowish brown hue. We have found that the take home method gives the best results in the long term.